Stowe, Vermont's food scene has taken off as this ski town has blossomed into a four-season destination. Before you hit the slopes or the trails, make plans to dine out at one of these top 10 restaurants. 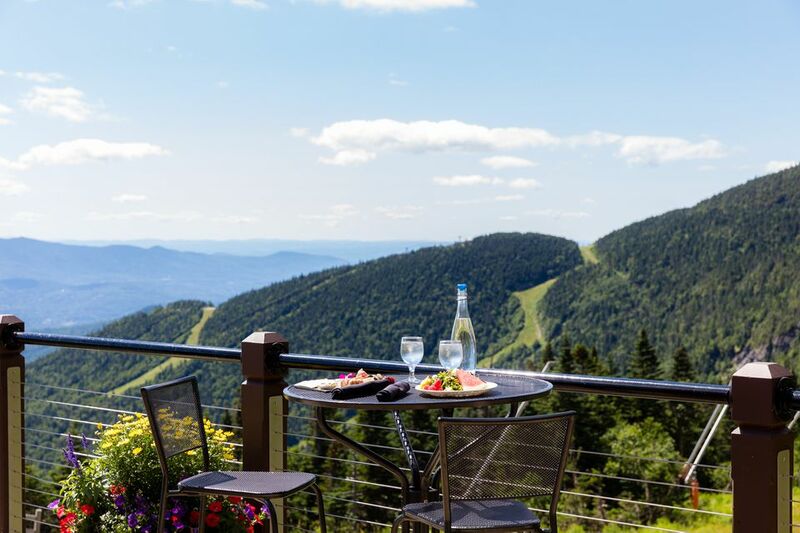 Stowe's Topnotch Resort is tops for outdoor dining with crisp mountain views and culinary pizazz. The Roost is the property's casual dining option. Flannel is its upscale, yet unpretentious celebration of Vermont's bounty. Both restaurants offer al fresco dining when the weather is warm. Kick back by a fire pit or under the pergola with shareable apps and Vermont-brewed beer. Or reserve an umbrella table for a memorable dinner, from signature cocktails like a Maple Manhattan straight through to S'mores by the fire for dessert. The accolades keep pouring in for this cozy-casual breakfast restaurant tucked inside a whitewashed brick inn on Stowe's Main Street, across the street from the Stowe Recreation Path. The wait for a table can be upwards of an hour, but you're in a great location to stroll and kill time: Think of it as pre-burning the calories in your biscuits and gravy, blueberry pancakes or powdered-sugar-sprinkled French toast. You're in for old-fashioned tastes here: fresh-squeezed orange juice, dairy from down the road, homemade sausages and, of course, real maple syrup. Stay at the Butler's Inn, and you'll save 20 percent on food in the restaurant. Gorgeous cupcakes, cookies, pastries, eclairs: The sweet temptations at this buzzy bakery take the cake. Everything you see is baked fresh daily using top-notch, often local ingredients. If you have time to linger, start your day with a breakfast sandwich on a buttery, flakey, just-baked biscuit, or slather flavored butter on an airy popover. At lunchtime, soups, paninis and daily blue plate specials vie for attention. Custom-crafted coffee beverages will warm you on ski days; frozen coffee drinks will revive you when you've been playing in the summer sun. Any dining adventure that begins with a gondola ride is bound to offer impressive views. The chalet-style Cliff House at Stowe Mountain Resort has floor-to-ceiling windows that frame a rugged scene of pine trees clinging to craggy mountain slopes. Here on Mount Mansfield — highest peak in Vermont — you can enjoy lunch any time the gondola is in operation including during fall leaf-peeping season. The menu is inspired by local and seasonal ingredients, and while the cuisine's not the star here, you'll also have a view of chefs at work in the open kitchen. Bring a jacket, even in the summertime, if you plan to eat out on the patio. On select Saturdays year-round, the gondola whisks guests with advance reservations to the Cliff House for themed wine-tasting dinners. Savor six courses, paired with wines, by candlelight. Foodies will tell you that Hen of the Wood in nearby Waterbury (and also in Burlington) is as good as it gets in Vermont, but you don't have to leave Stowe to taste the thoughtful, local-focused cuisine on which Eric Warnstedt and William McNeil built their restaurant business. The Hen of the Wood co-owners opened Doc Ponds in 2015 in Stowe. The laidback haven for connoisseurs of craft beer and elevated comfort food has shot to the top of the restaurant rankings. Eye-popping burgers — two Vermont beef patties layered with Vermont cheddar and special sauce — steal the show, and, as the menu morphs daily and seasonally, you'll find plenty of other irresistible delights pouring out of taps and emerging from the kitchen. Make reservations or risk disappointment at this popular Stowe date night spot. Chef-owner Aaron Martin has returned to the kitchen, and that means you're in for inventive, California-inspired fare — including vegan options — made with the best of what Vermont's farmers and producers have to offer. Every dish is so artistically plated, you'll be reaching for your cell phone before you reach for your fork. That's true at Sunday brunch, too, when you can opt for small plates like the cheddar and maple donuts, medium-sized sweet or savory dishes and even "heavy things" like a wood-smoked burger or cauliflower steak. Open to the public, the restaurant at this exquisite country inn proves sophisticated fine dining can feel fun and approachable. With bright and airy decor, toasty fireplaces, a waterside outdoor patio and lovely views year-round, the environment alone will satisfy your senses. Then, you'll taste chef, and Vermont native, Jason Bissell's creative seasonal dishes, and your senses will positively swoon. From sustainably farmed, local, grass-fed beef to Vermont-grown vegetables, Bissell cooks dishes like ribeye with candied pearl onions, king oyster mushrooms, bleu cheese whipped potatoes and black garlic butter that will live in your memory long after your visit to Stowe. Ask locals to point you toward the best pizza in town, and chances are high you'll wind up at Piecasso. This energetic, bright-hued pizzeria and bar dishes up thin-crust pies hand-tossed the old-fashioned way and topped with your choice of four sauces, oozy cheese and an array of fresh toppings. Want gluten-free crust? Or honey wheat? Both are options, and there are artisan specialty pies for all taste preferences, too, whether you're the white sauce, spinach, artichoke hearts and Vermont goat cheese type or a carnivore drawn to the meat pile-up pizza christened "Carcass." Order your pizza to-go if you don't want to risk a wait for a table. Or drop a few bucks letting the kids play arcade games while you study the beer list and menu. Piecasso has salads, sandwiches and pasta options, too, plus an extensive and affordable kids' menu. The hills are alive with the sound of clinking beer glasses at this Austrian restaurant on the grounds of Stowe's Trapp Family Lodge, owned by the family whose story inspired "The Sound of Music." After a day of cross-country skiing or mountain biking on the resort's trails, which are open to the public for a fee, you'll love stopping in to sample German-style lagers crafted in the 30,000-square-foot on-site brewery. A wood-fired grill keeps the dining space toasty; long tables encourage mingling. Order a beer flight, and see what pairs best with bratwurst and spätzle and schnitzel. Be sure to save room for the apfelstrudel. Want a behind-the-scenes look at the beer-making action? The observation deck is open weekdays from 11:30 a.m. to 9 p.m., and brewery tours are conducted on weekends at 1 p.m. and Tuesdays at 6 p.m.
A fixture since 1950, "The Horn" is nightlife central in Stowe, especially on cold winter apres-ski nights, when the fireside gameroom's pool tables and arcade games call to kids and adults. There's a toasty fire in the riverside dining room, too, and the menu runs the gamut from brick oven pizza to sushi. Live music adds to the fun on select nights.